Commonly known as the ‘Fishbone Water Fern’, Blechnum nudum is a fern that is naturally found growing found in gullies and along water courses. This is a fern that will naturally spread by underground rhizomes to form a clump overtime. If you grow this attractive fern over a period it can from a short trunk and make a very interesting feature in a damp shaded area of the garden. Found widely in Victoria, NSW, TAS and QLD they are a fern that do require constantly moist conditions and are well suited to grow in pots and containers in cool shaded positions. Reaching a height of over 1m in time with a spread of around 1m Blechnum nudum makes a good potted specimen plant for indoors in a well ventilated cool position. Also widely used for underplanting trees where they are used as a groundcover plant. 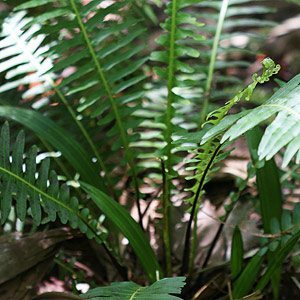 Blechnum nudum is an unusual fern in that over time it will form a small trunk, however it is not related to tree ferns. It is a great fern for cool moist conditions and useful as a landscaping plant in shaded areas between buildings as long as moisture is available. Filtered light that mimics its natural rainforest habitat is essential. Exposure to hot direst sunlight will cause sever leaf burn. A little slow release fertilizer once a year is sufficient in most cases. The key to growing this unusual and attractive fern is moisture through summer.